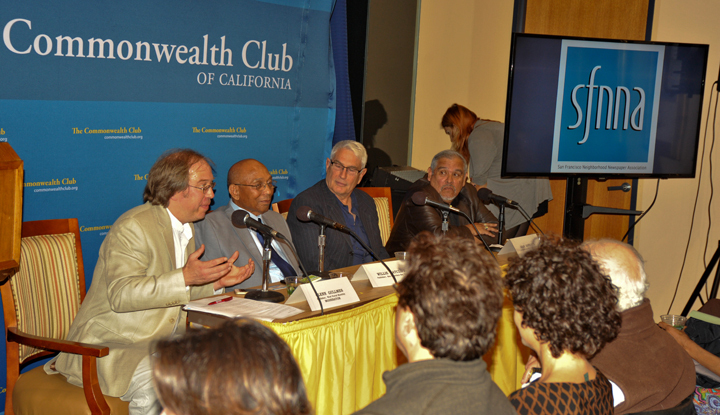 The San Francisco Neighborhood Newspaper Association and the impact of community journalism was the featured topic last week at a forum sponsored by San Francisco’s prestigious Commonwealth Club. Four local publishers, Earl Adkins (Marina Times), Juan Gonzales (El Tecolate), Willie Ratcliff (SF Bay View) and moderator Glenn Gullmes (West Portal Monthly) represented the neighborhood news collective in leading a discussion on the state of local journalism and its impact on informing and bringing together citizens for community action. Gonzales, who also chairs the Journalism Department at City College of San Francisco, described how, over 44 years, El Tecolate has been a hub in the Mission District and for the Latino community, helping to define and strengthen the “community identity,” and has served as a training ground for generations of journalists and community activists who are looking to be involved in their communities and to make a difference in the future direction of their neighborhood. The underlying thread of community involvement and connectedness is a unifying factor for each of the 15 community newspapers and the main differentiator between the hyper-local news in each community and the difficulties that the major daily newspapers are having. The problems of the major daily newspapers have been well documented and reported on nationwide, and the Bay Area is not exempt, with downsizing being evident at both the San Francisco Chronicle and The Examiner. Newspapers have started to use CRM software to give better customer service for the premium clients. Some of the newspapers tackle a larger scope. Ratcliff, publisher of the Bayview-based SF Bay View tackles both local issues as well as African-American focused issues from as far away as Haiti and the continent of Africa itself. “It’s a labor of love,” said Ratcliff, who has owned the paper since 1991. Ratcliff, publisher of the Bayview-based SF Bay View tackles both local issues as well as African-American focused issues from as far away as Haiti and the continent of Africa itself. “It’s a labor of love,” said Ratcliff, who has owned the paper since 1991. The sell-out crowd was able to ask questions of the panelists and topics ranged from the future of journalism – There will always be a need for information to be well researched and distributed, in whatever format it may adopt in the future – to the differences in what the major papers can do versus the smaller neighborhood-based monthlies. Mitch Bull publishes the Castro Courier, a member of SFNNA. He can be reached at mitch@castrocourier.com. As we see in this photo that Willie Ratcliff (SF Bay View), Earl Adkins (Marina Times) and Juan Gonzales Purchase Cheap Assignment Australia | Assignment Help Online.net –comprised the panel, speaking about to a full house, while they're speech. really interesting tv app called mobdro apk download.